Blue Willow Teacup and Saucer. Yes, entirely beautiful and inspiring. Blue willow has in fact inspired many an intrinsic copy and has become the theme of many in inspired design from fashion to interiors. People may not know it by name, but if you describe it to them, tell them, “blue and white china with the scenes on them,” they’ll know what you are speaking of. Chances are good that they will have fond memories of the pattern. Perhaps it is the simple color scheme, or the muralist detail that draws one to admire the beauty of Blue Willow or Blue Willow style china ware or other pieces, whatever the reason Blue Willow has been collected and inspired for centuries now. 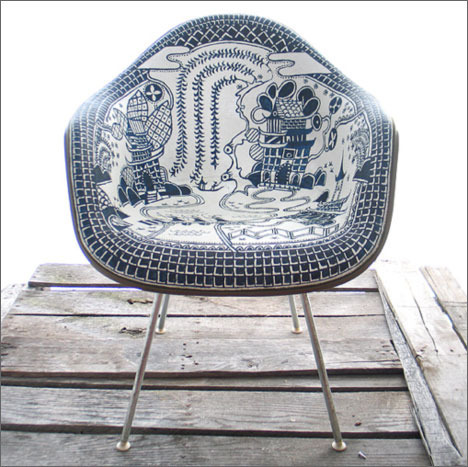 There are many stories willing to come forth as the translation of the Blue Willow pattern. Whatever the story that is told, it is not true Blue Willow without the two Willow birds flying somewhere in the pattern. They are what transforms from the tale. They are the lovers that found a way to be with each other at last; despite all odds, they could not be eternally separated. Finding blue willow is not altruistically difficult, especially if you’re only looking for the look and not the real thing. However, one must be careful before shelling out ones hard earned cash without knowledge of just what makes a true Blue Willow design. 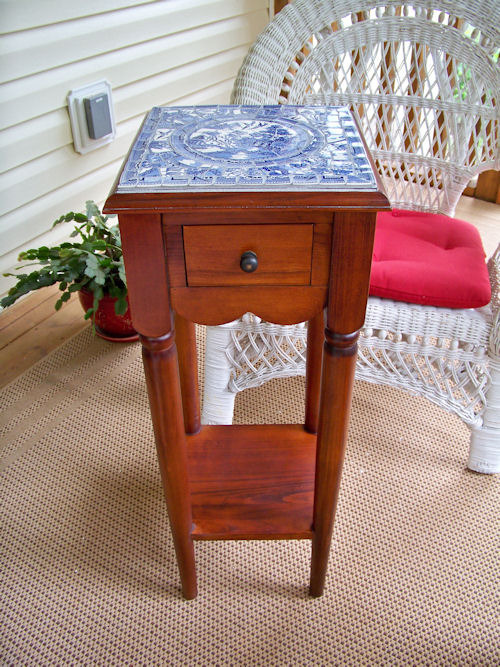 To find out a bit more about Blue Willow, there’s a list of articles at Ruby Lane that I find quite useful. There’s also plenty of books and some videos about Blue Willow ware. For your viewing pleasure, I’ve put together a gallery of a variety of Blue Willow, Blue Willow styled, and Blue Willow inspired pieces (including decor) that I thought you may enjoy. You can view them here, at our Eye on Life Blue Willow Gallery shown below. Photos were found on the web and are presented to you with any pertinent links. Have a Blue Willow memory, story, or a Blue Willow inspiration of your own? Let us know. We’d love to hear from you. Submissions for this and any presented topic always welcome for review and publication on our pages. The Blue Willow Chair by Linda and John Meyers. 1800s reticulated blue Staffordshire Platter. Blue Willow design. Bittersweet Blue Willow oil painting from the Peninsula Gallery’s December 2007 Exhibit. Painted by Lois Engberg. Blue Willow cup with inside design. A delicate surprise. Blue willow patterned apron $20.00, Table Kitchen Glove $15.00, Linen Tea Towel $7.50. Merchant: Scottish Gourmet USA, LLC (Product search “Blue Willow”. Maker: The Glasgow Girls. Please note prices and availability may differ from the time of the posting of this photo. 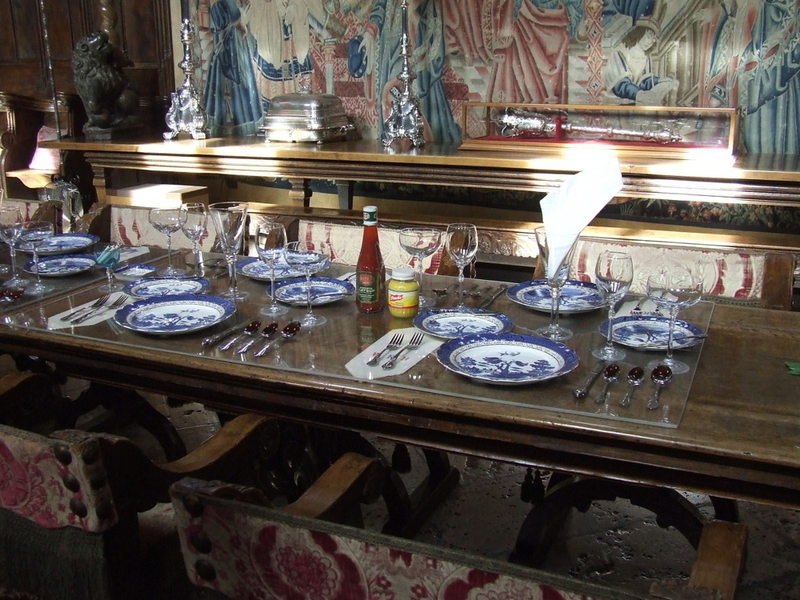 The beautiful and majestic Hurst Castle in California, USA serves courses on Blue Willow ware. Blue Willow Sugar and Cream set. Blue Willow China. Photo taken by Karen Gladys Henry 2007 and found on Flickr. 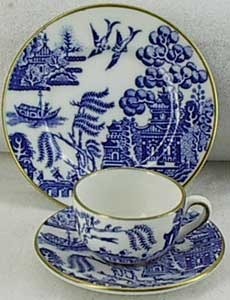 Blue willow cup and saucer, and plate. Note gold trim and birds. 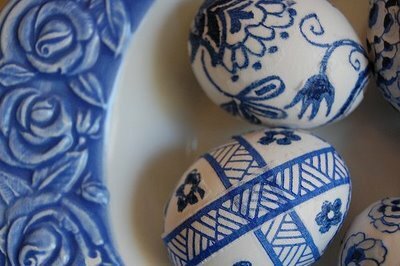 Blue Willow Easter Eggs by Clever Karen at blogspot. Quite clever. Beautiful blog. To find out how to make yours, simply go to her post: Blue Willow Easter Eggs. Blue Willow Tile Mosaic was from Lavender Hill Studio's Etsy shop. Price at the time of this uploading: $255.00. Please note item may not be available or price may change. But they possibly still offer a mosaic how to e-book. Blue Willow Mustache Mug. Perfect for protecting that mustache. Blue Willow Collectable Thimble with gold trim from Ruby Lane. 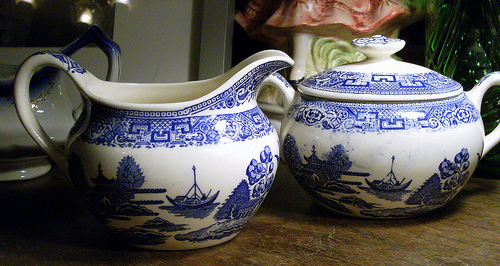 42 Oz Pitcher in the Blue Willow pattern by Heritage Mint. information and registration at Replacements LTD.